There is something that strings all these different local bands together… Mr. Marco’s V7, The Grisly Hand, Ernest James Zydeco, Dead Voices. Or rather, someone. Musician Mike Stover plays in all of these bands and more. Normally when you hear a story about a band you hear from the lead singer or songwriter, the person at the front of the stage. Mike Stover is normally in the back or off to the side, sometimes sitting down, he doesn’t sing, just sticks to the strings. On the night of The Crossroads Music Festival last month, musician Mike Stover was one especially busy guy. 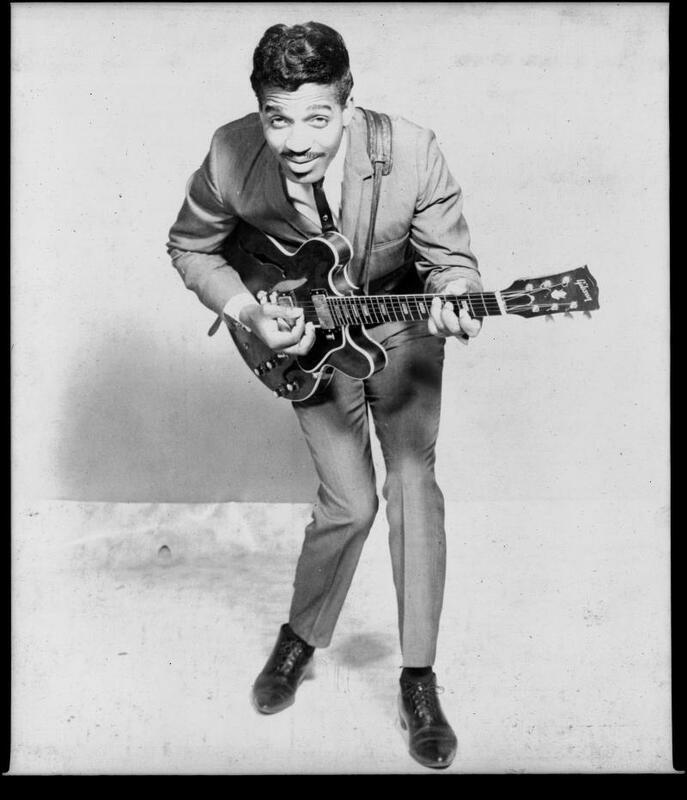 "Played that show at the Crossroads with Grisly, then I packed everything up and drove across the street, to Collection, played a couple songs with Erik Voeks. Packed it all up, when I got to The Brick we were running a little behind with Eric, Dead Voices had already started, so I just threw all my stuff on stage, and jumped in mid song, and then the last gig of the night was Mr. Marco’s V7," says Stover recounting the night. That’s a particularly busy example, but each week for Stover consists of at least a couple rehearsals, and a gig or two, or sometimes more. All this is on top of holding down his day job at the audiovisual desk at the Kansas City, Kan. Public Library. The gigs pay some, but he doesn’t make a living as a musician. In his home basement studio, Stover has a practice space for several of his bands. We listen to a recording from another band he’s a member of — People’s Liberation Big Band, which is a group of more than a dozen members. Stover plays the guitar and steel guitar. "It’s so weird hearing yourself play," he says. He says recordings from even a few years ago can be hard to listen back to, because he’s a better player now and feels like he is always improving. 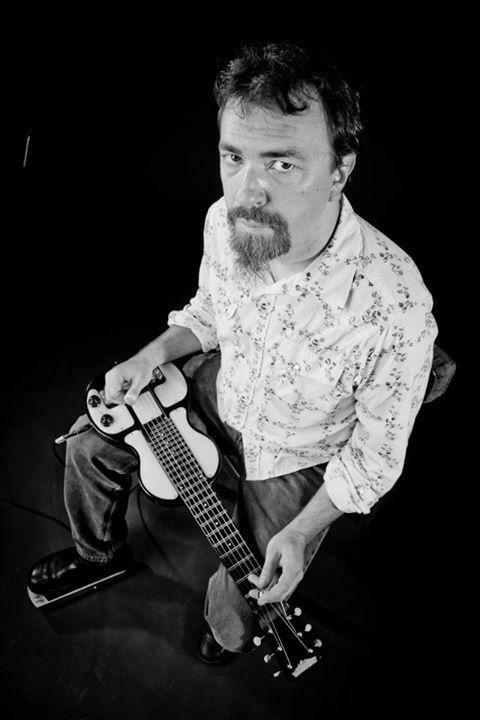 Originally from Joplin, Mo., Stover is primarily a self-taught musician, he started playing the guitar when he was 11 years old and has since expanded his range of instruments and abilities — he plays banjo, pedal steel, lap steel, mandolin and bass. After spending some time in Texas, he moved to Kansas City in the late 1990s. "I’m also a really shy musician so I lived here for a while an didn’t do a whole lot," he says. But that changed, the more he got to know more people. "I guess the word kind of got out that I had more instruments at my disposal," he says. "Because, you know, there are a lot of great guitar players in town, but there’s not a lot of guys who can play the steel guitar who are interested in playing something that’s not country for example." Stover’s interest in a variety of genres, and string instrument stock made him a desirable candidate, and easy addition for bands looking for added flair and different sounds. 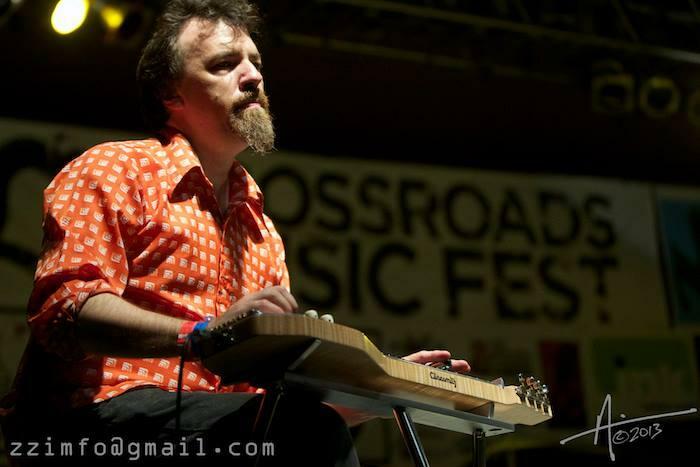 In 2006 he joined Mr. Marco’s V7, where he plays the theremin, mandolin and steel guitar. Over the past seven years Stover has gotten busier and busier. Ernest James Zydeco band needed a bass player; he joined Dead Voices playing the lap steel; he joined Americana group Grisly Hand on the banjo and steel guitar; he joined James Isaac Group, a jazz ensemble, on the guitar. "I have a hard time saying no which is good and bad," says Stover. The good part about being Mike Stover is he gets to play a lot of different types of music, which he likes, but he does receive gentle heckling from band mates. "Marco Pascolini called me the Swiss army knife of the KC music scene because I have all this stuff at my disposal," he says. "And ya know.. sometimes I run into booking problems." I ask him if he has a favorite of his bands, and he laughs. "I absolutely cannot answer that… no. uh no," he says. "I’m just glad they’re all there because it all balances out." In his studio Stover shows me the lap steel – a stringed instrument that lays on its back that’s plucked while applying pressure using a steel bar on the fret board. He plays this in Dead Voices and sometimes in Grisly Hand. Mike Stover plays in a number of Kansas City bands. This year he is working on the music for a locally produced film. Stover says he doesn’t have a hard time remembering all the song structures for all the different bands, the challenging part is remembering which instrument he’s playing, how it’s tuned and the string variations. "They all feel different on your hands so there’s a little bit of that muscle memory involved but every once in a while that fails you," he says. "And I’ll be looking at a note thinking I’m on a B but I’m on a C."
Stover says he likes being off to the side or in the back. He doesn’t want to be a front man or band leader, and likes working collaboratively with his band mates. "It takes a little bit of pressure off for sure, as opposed to being a band leader where I can just add my part and if it’s not there it will be missed, but if it’s not there it’s not going to bring everything crashing down, he says. But Stover’s about to make a big step, out of the background and into more visible vulnerable place. He’s been asked to create the score for a new locally shot and directed film, Kick Me, which is in production and scheduled to come out next year. "That’s the scary part when I’m down here by myself and it’s like OK now I have to make music," he says. "I can’t just be running to the next thing playing what somebody told me to." In the last two months Mike Stover played 22 shows. He plans to chill out his gig schedule in the next couple months as he focuses his energy on writing for the film. He also says, understandably so, that he and his wife could sure use a vacation. Friday, November 1 - Ernest James Zydeco at Frank James Saloon, Parkville, Mo. Saturday, November 2 - Storytelling with Gina Kaufmann at The Brick, Kansas City, Mo. Saturday, November 9 - Ernest James Zydeco at Llywelyn's Pub, Olathe, Kan.
Saturday, November 16 - Into The Night Sea (multimedia project) at The Toy And Miniature Museum, Kansas City, Mo. Saturday, November 23 - The Grisly Hand at The Record Bar, Kansas City, Mo. Vi Tran is a singer/songwriter who uses his experience as an actor to create music that combines melody with heartfelt expression. His new album, “American Heroine” plays like a soundtrack to an off-Broadway musical. In today's "Local Listen" we hear the title track from the album. 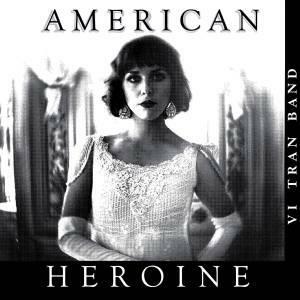 The Vi Tran Band will perform at the Kill Devil Club Friday evening, October 4 to celebrate the release "American Heroine." The CD will be in stores on Tuesday October 8. This month, the Chicago-based Numero Group released a compilation of funk and soul songs originally put out by Kansas City record label, Forte, in the late 1960s and '70s — Eccentric Soul: The Forte Label came out this week on vinyl and CD.